The architectonic ensemble of the new Griebnitzsee University impressively reflects the changing history of the site. The old building, constructed in the heroizing style of National Socialism, was broken up and penetrated with a new building in order to manifest the democratization of the place architecturally, as well. A grove of trees between the old and new buildings was retained and offers students a place to linger. The history of the site is symbolically closely tied to the color red. This is where the German Red Cross, brought into line by Hitler, had its national main office – until the Soviet Red Army conquered the grounds from the National Socialists in World War II. The emblematic color of Socialism then set the tone until the turn away from Communism in 1989. 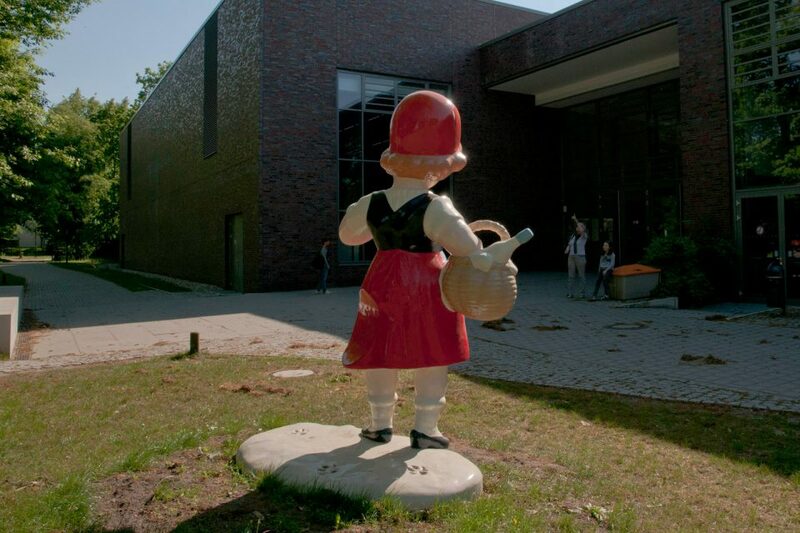 A red head covering also gave a name to one of the best-known stories in Europe: Little Red Riding Hood. The familiarity of her image opens up far-reaching and unsuspected possibilities for an artistic intervention at a site as historically encoded as this one. 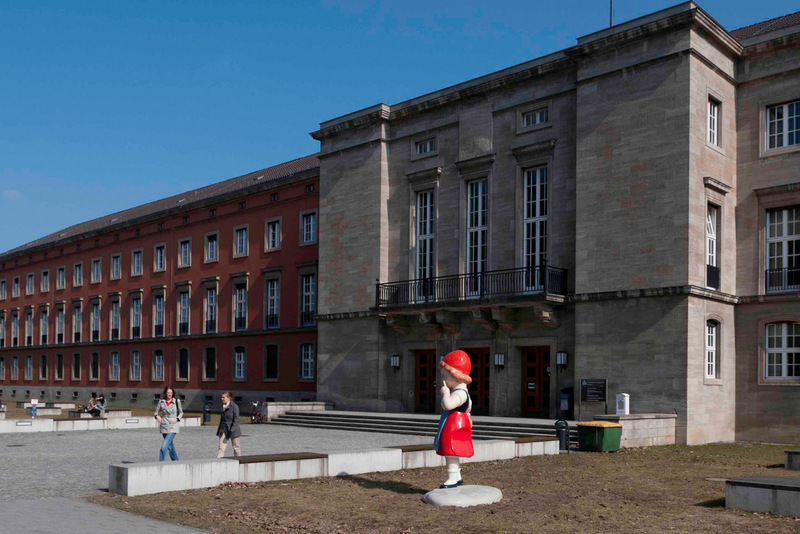 At three positions of the newly created university grounds, identical versions of one and the same sculpture were erected, in order to make use of the potential of the different architectural epochs as foils. 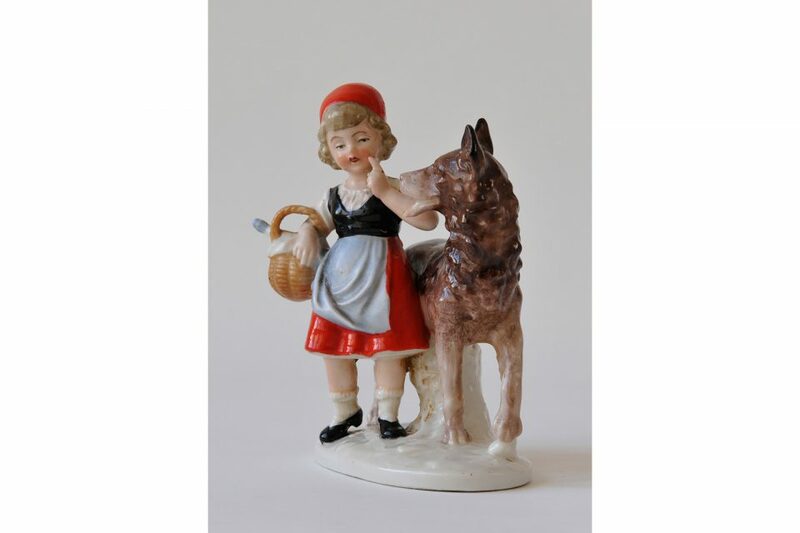 The starting point was a porcelain ensemble from the 1930s depicting “Little Red Riding Hood and the Wolf”. We enlarged the hand-sized ensemble to 230 centimeters, removed the figure of the wolf, and left Little Red Riding Hood on the pedestal that now seems a bit too large. 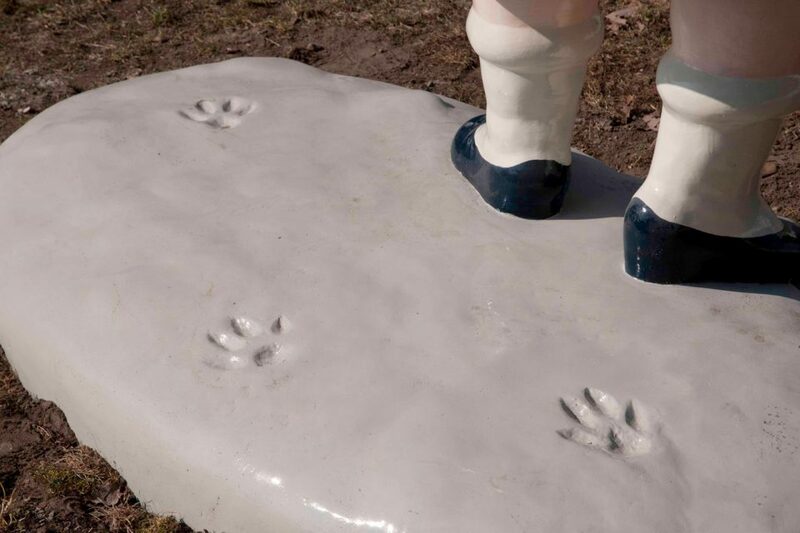 A trace of the missing wolf can be made out in the paw prints in the pedestal and in the strange-seeming indentation in the skirt of the figure of the girl. Little Red Riding Hood and the Wolf are an established unity of opposites, inseparably connected and always mentioned in the same breath. Little Red Riding Hood stands for goodness, innocence, and purity, while the wolf is absolute evil. By removing the figure of the wolf, evil is depersonalized and removed from the depiction and danger is robbed of its concrete form. The resulting void creates a space of resonance in which new, surprising associations can unfold against the various backdrops of the sculptures’ placement. 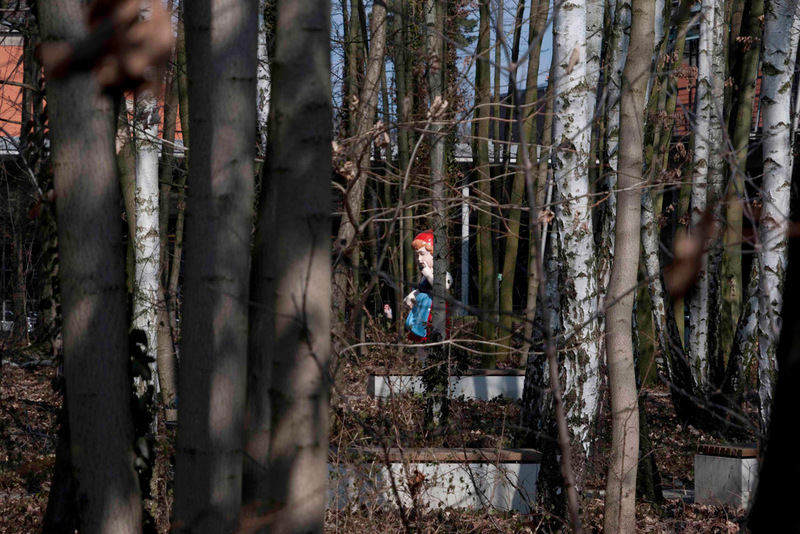 In front of the old building in the “heroic style”, the stylistically fitting depiction of the ensemble triggers thoughts of the fascist period; in the woods it seems entirely natural and as originally described in the fairytale. In front of the new building, finally, it is confronted with today’s contemporary architectonic situation. 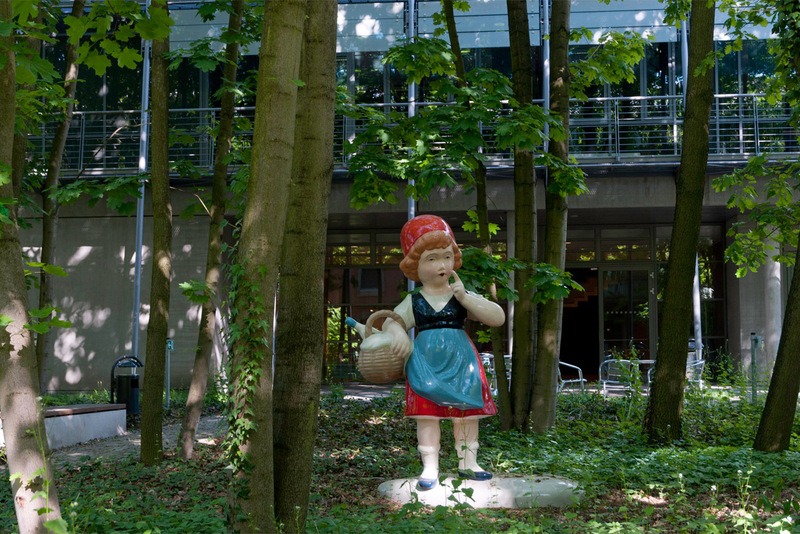 In the context of the university with its checkered history, Little Red Riding Hood can be read as a symbol of the individual threatened by totalitarian forces.